Team Canada 3 - Team USA 2 (OT) -- thanks, Sidney Crosby! The Olympic hockey result pretty much speaks for itself which is actually a very good thing. 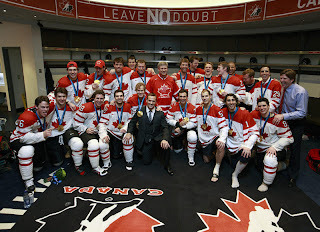 I've lost much of my voice after last night's Team Canada triumph over the good ol' US of A. It was no surprise that the impromptu street level celebrations that went down across Canada went off without any problems, any violence. That's just us... polite! It was a blast! Waving the flag, screaming and partying with our fellow Canucks. There's nothing like Canada earning gold in our national sport to bring all of Canada together. Nothing sweeter! Team USA really pushed Team Canada to the limit. The perfect ending to a wonderful Olympic Games in Vancouver. So happy, so bloody wiped out! Finally... we can get some rest!